Keep in mind, the NHL All-Star weekend will also invade Tampa this weekend. Get everything you need to know about the game and weekend festivities, here . The 2018 Seminole Hard Rock Hotel & Casino Tampa Gasparilla Pirate Fest kicks off on Saturday, January 27. The Gasparilla Invasion will start at 11 a.m. when the Jose Gasparilla will set sail at the south end of Hillsborough Bay and travel north to Seddon Channel to dock at the Tampa Convention Center at 1 p.m. The Parade of the Pirates begins at 2 p.m. The parade will begin at Bay to Bay Boulevard and Bayshore Boulevard It will continue along Bayshore Boulevard to Brorein Street turning east on Brorein Street and then north on Ashley Drive. The parade will end at Cass Street and Ashley Drive. The parade is FREE to attend. You can purchase reserved seating here . Avast ye! The City of Tampa wants you to be prepared for heavier than normal traffic on Saturday, January 27, 2018 in downtown and south Tampa as we batten down the hatches and prepare for great fun and high adventure during the 101st Annual Gasparilla Pirate Fest! The City is alerting the public of road closures and towing zones to minimize congestion in neighborhoods that border the parade route. No Parking signs have been installed in the neighborhoods west of Bayshore Boulevard and will be in effect beginning on Friday, January 19 through Saturday, January 20. 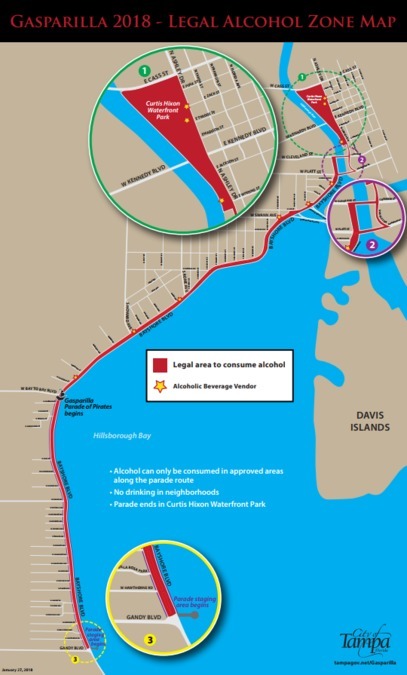 Please note: Only motorists with an ID verifying residency will be allowed to enter the Bayshore Gardens and Hyde Park Preservation neighborhood after the streets have been closed. For those attending the Straz 8 p.m. show, Poe Garage will reopen at 6:30 p.m. and there will be a $6 flat rate paid on entry. The McDonald's Children's Gasparilla Extravaganza kicks off the Gasparilla season on Saturday, January 20. Shuttle service from the Fort Brook Garage, located on the corner of Franklin and Whiting Street, will operate one continuous shuttle route on January 20, 2018 from 10 a.m. – 8 p.m. Cost is $10 per adult, children accompanied by an adult ride for free. The shuttle will deliver to Bayshore Boulevard, near the beginning of the parade route at Bay to Bay Boulevard and the Crosstown.